The life of Emperor Wu Zhao (popularly known as Wu Zetian) possesses some similarities to that of Hatshepsut, Pharaoh of Egypt. They are both women and rule at a time when women rulers were deemed to be an abnormality. Also, both employ unconventional tactics to keep hold of power in a male dominated world. Significantly, both women’s reigns are seen to be relatively successful in today’s world. Hence, when I saw the opportunity to read about the first female emperor of China, I had to seize it. When your political opponents call you “cold…, of lowly birth,… half-viper half-chameleon,… ravenous jackal…hated by men and spirits…” then you know you are in for a rough ride in your career. However, these are the words used by one of the prominent scholars of Wu Zhao’s day to describe her. The author devotes a great part of the book to detailed information on the ancestors and goddesses Wu Zhao used to silence those who opposed her. Emperor Wu Zhao & Her Pantheon Of Devis, Divinities, And Dynastic Mothers is heavy on details on Chinese deities. The information is put in an organized form and this helps with quick references. The book did not dwell on the Emperor Zu Zhao’s background, but instead focuses on her accomplishments and reforms (which she sometimes enforces in a cunning way). The writing is straightforward and stripped of flowery language - everything is quick and straight to the point. For those who seek to learn more about the political feats of the first female emperor of China, this is a fine reference book. 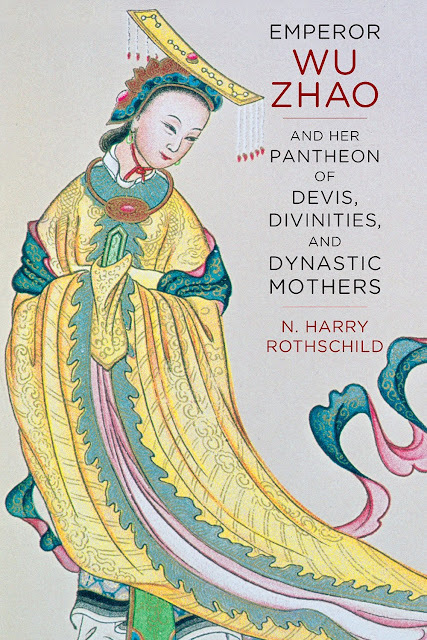 Emperor Wu Zhao & Her Pantheon Of Devis, Divinities, And Dynastic Mothers is written by Norman Harry Rothschild and published by Columbia University Press (June 16, 2015). Many thanks to Columbia University Press for review copy. All images are © to their respective owners.